Why people think tax reform is a knife, and why that’s a problem for Australia. EDITED on Tuesday September 29 to make it better, fairer, more accurate. My hypothesis is this: A large part of the Australian public does not understand the tax reform “debate” at all. a substantial part of the tax reform debate. I hypothesise these people are smart, capable and have Australia’s interests extremely close to their heart. But they have no training in tax theory and therefore lack mental models to understand why, for example, Labor’s Chris Bowen, Shadow Treasurer, would be willing to consider cutting corporate tax to 25 per cent. They just don’t see how tax affects growth. The most mentally available model of tax is not one where tax is an ingredient in making the cake, but a knife to cut it up with at the end. This matches lived experience. As a worker and consumer, tax happens at the end of transactions. You get paid, then you pay tax. You buy something then you pay GST at the checkout. So my hypothesis is the concept of tax as an input to the rate of economic growth is not one that is available to most people. I’ve been thinking about this hypothesis for a while. Today I decided to test it. I chose the following four tax-related articles and read the comments in all of them. SMH: Scott Morrison: Work Save Invest the Mantra for the new Treasurer (90 Comments). If people understood that the tax reform was about boosting growth, I expected to see comments engaging on that topic – supporting the link or refuting it, talking about high-tax high-growth countries like Scandinavia, and low-tax low-growth countries too. If people did not bring this frame of reference, I expected to see the comments focus on other topics, especially distribution. I coded them according to whether they mentioned growth or output; distributional outcomes; loopholes; or ‘other’. ‘Other’ accounted for over 200. The remaining results were crystal clear. 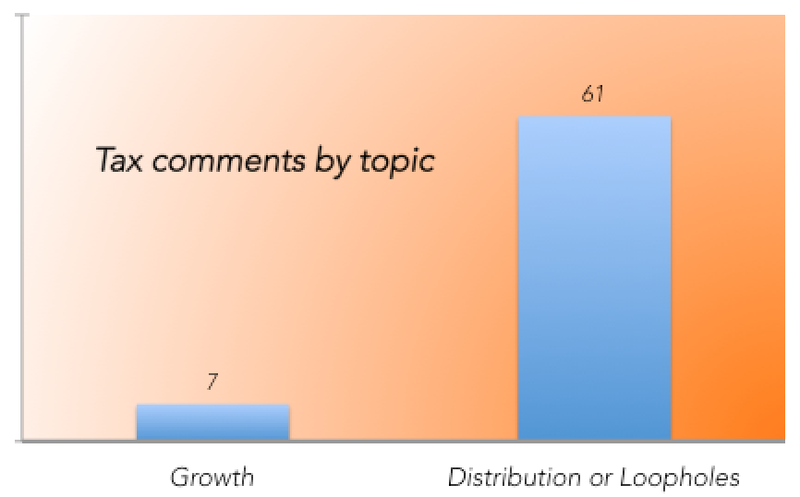 Discussion of growth was present in just over two per cent of total responses and was outweighed by discussion of distributional issues about 9:1. Please note that I am not criticising this last comment. Distributional issues are a crucial part of tax policy and that kind of comment is an important input to a well-grounded tax debate. The point is we do not have a well-grounded tax debate until everyone is on the same page. The broader tax debate does not address the impact of tax settings on the output capacity of the economy. It is far more focused on fairness. The “elites” must work to understand the grip matters distributional have on the public imagination. If they still want to press on with tax reforms – and I think they probably should – they need to take two courses of action. Prioritise matters of distribution in their own thinking. No tax reform will be possible so long as it obsesses on output to the exclusion of fairness. Multinational enterprise tax reform was a very common thread in comments about fairness. Work to give people the mental models to understand how tax affects output. Without this very little tax reform will be possible at all. Elites, building a case for reform does not mean repeating the phrase “We need reform!” It’s truistic to the people who understand it, while confusing and annoying to everyone else. It sounds like you’re talking in code, and that implies you’re plotting something. If you hector people about tax by saying “it affects investment decisions!” you’re unlikely to cut through. “Investment decisions” sounds like it has something to do with Macquarie Bank. The comments on the article about Scott Morrison’s “Work Save Invest” slogan showed “investment” was uniformly interpreted as being about buying shares. Many commenters pointed out they couldn’t afford to do that. “Foreign investment decisions” is probably even worse language. It conjures Chase Manhattan and Bank of China conspiring to rip us off. Talk about economic growth in language people can understand. Use this language even among yourselves, so when it comes time to talk to “real people” it comes naturally. Tax is not just a knife, but also the yeast that grows the cake. The economy is like a party and tax is adding water to the beer. The economy is like a football match and tax is like adding more umpires ready to blow the whistle at any moment. They disrupt the natural flow of the game. The economy is like a road and tax is traffic lights. If we put in too many in the road won’t be useful any more. But that can’t be all. The explanation needs stories about business owners who expand their business once their returns meet a benchmark, and how returns are affected by tax. I can imagine an animation. A business owner making a business plan. Every time she does the maths she comes out in the red, until the tax percentage becomes lower. Then she opens her shop and hires some staff. Understanding a concept requires knowing several mutually-reinforcing stories that illustrate the same point. The Australian people have not heard enough of these stories. And that is why Tax reform is going nowhere. Just as the tax reform debate threatened to choke itself on too many conflicting agendas – increasing the GST, lowering company tax, fixing bracket creep, doing something about superannuation tax concessions – our new treasurer has injected a rather important ingredient: the need to define a reason to do it all.Some of the contributors to the AFR Tax Reform Summit this week have made the observation that an organising principle for the tax reform debate has only rarely been seen amid the worthy, but perhaps too often repeated, calls for individual tax measures to be addressed. The organising principle needs to be a political argument to voters about why you actually need to mess around with tax in the first place. An argument about corporate competitiveness isn’t really going to cut it out in the ‘burbs. So if Morrison wants to prosecute that case for tax reform he needs to formulate a story that’s as clear as “Stop the Boats” but for a much more complex concept. Good luck Scott. Here’s a late-breaking caveat I decided to add. Among the people who appear to not understand the nature of tax reform are a group who understand it perfectly well but oppose it. They fan the flames of the distributional arguments. They’re not the only self-interested sorts in the debate. The fact company tax cuts are now widely accepted as the most growth-crucial tax cuts in our whole economy is very interesting. Of course cutting it would help growth. But at what revenue cost? And why is it #1? Self interest lurks in any issue where facts are complex. Does a “free” market really know best? Hopefully my thoughts on your questions will explain mine. You ask at what revenue cost? So let us graciously imagine we have two tax rates 40% and 60% and also assume a growth rate of 3% and 2% respectively and indefinitely. – How long until the 40% tax actually collects the same amount as the entire 60% economy? Around 100 years. – How long until the immediate gains of the 60% rate no longer exceed the benifits of the 40% rate? Around 40 years. So who is doing the cost benefit analysis? Is it the current 4yr term government, a taxpayer or a corporation, something looking at their great grandchildren future? You ask why is it number #1? Simply put a corporation is a centrally planned self interest. A business does the exact same thing but it is encapsulated with a market. This is why I think businesses are unique. They represent successful central planning in a market environment. Their increasing and unrivaled power represents mankind’s progress towards “brute forcing” the calculation problem. No individual can compete and only a greater special interest can replace them. The issue of “growth” needs some unpacking. The economy might grow, but if the profits of that growth are too narrowly captured because of badly designed tax and distribution systems, regulation, access to markets and externalisation of costs then selling tax reform as an input to growth might be irrelevant to the people who don’t see themselves as beneficiaries of growth. I totally agree. growth at an economy-wide level is all but irrelevant if it’s all jobless mining exports, or aggregate growth and per capita shrinkage. I have an unfinished series on the link between growth, employment and population growth that I must continue very soon. Especially since the release of record low population growth numbers this week. 1. Didn’t the failure of Reagan’s tax cuts kill this “tax cuts = growth” argument? There’s empirical evidence that most people ended up worse off, some much worse off while a few were very much better off. 2. Corporate tax cuts benefit foreign investors most. For local investors the profits are eventually paid out as dividends and taxed at whatever the individual’s marginal tax rate is, less any franking credit for the company tax paid. It’s the individual tax rate that will make a difference there. 3. You could more easily construct an argument that the tax reform we need to stimulate growth is to increase top rates of income tax and lower the rate of GST. This will stimulate consumer demand and grow the economy. I know the world is more complex than that but in 2 sentences I’ve at least explained a mechanism other than blind faith for that growth. 1. I think what the Reagan tax cuts disproved was the laffer curve idea that you could raise more revenue with lower taxes. That may be true if your taxes are 99.9 per cent but it’s not relevant to us. I’m not a particular expert on the Reagan tax cuts so I can’t say if they caused economic growth in America. But what I’m proposing is not necessarily tax cuts, so much as changes in the way it’s paid. More land tax, less stamp duty, for example. Raising more of the money using more of the efficient taxes, and less using the inefficient taxes. 2. This is an idea I’m still coming to grips with. I read a good article by Greg Jericho on it (http://www.theguardian.com/business/grogonomics/2015/apr/20/grogonomics-if-joe-hockey-wants-to-cut-company-tax-smart-way-to-do-it) and I’m trying to reconcile that with the claims by Treasury that the incidence of company tax falls on workers. On twitter someone explained to me that the incidence of company tax falls on capital and labour. On the capital side, many benefits flow offshore. But on the labour side they stay here. 3. I think that’s a perfectly decent argument to make that would require modelling to disprove. Making that argument though, I think puts you in a relatively minority of people who grasp the link between tax and growth and are engaged in the mechanics of how and why. Is this, Matt, as I fear, a strangled articulation of disappointment in the post, rather than, as I hope, a piratical affirmation of its content? Yes, the former. This idea that there is something illegitimate about “fanning the flames of the distributional argument” really irritates me. I’m sorry that comes across as the main thing to take away from the post. I am really trying to be more about building up understanding of the possibilities of tax changes to affect economic growth than tearing down distributional arguments. I know there is limited space in the tax debate but I hope the two could be discussed without it being zero-sum. Perhaps this rests on my (optimistic?) belief we can effect tax reform that is growth-positive *and* not simply for the benefit of the few! I think if the reformers hadn’t buggered up distribution in the last 30 years voters would be more open to trust businesses. Fact is its been ignored especially the distortion of the mining boom so people aren’t willing to listen til you fix their immediate problems first. We absolutely shouldn’t trust business to make tax reform. That’s why I want everyone on the same page. The average punter needs to be able understand the arguments being made and engage with them on their own terms, instead of interpreting them only through distribution. I don’t want to diminish distributional arguments. I’m aware of their importance. But I think my fundamental argument stands because even among the people I saw online *supporting* tax reform, distributional arguments are foremost. Even the KPMG guy in this AFR article argues for tax refom by saying the rich pay too much tax. I think I’m struggling to understand your argument (and I have and economics degree). Aren’t distributional arguments about capacity not just carving up the pie? It seems to me the reform era has allowed capital to accumulate at the top at the expense of wages growth. That means more of the capital is being used by people who have a lot smaller marginal return for productivity. For example Clive Palmer buying a dinosaur is far less beneficial for the overall economy than if a low income person had been given that money to spend on education, better quality food/health or even activities that increase their happiness. No matter how many tax cuts you offer business and high income earners it seems to me they aren’t spending it. As Glenn Stevens said there’s a distinct taming of animal spirits around at the moment and I think the best way to address that is getting more money in the pockets of more people as well as policies aimed at reducing housing prices and rents. Cutting corporate tax by 5-10% would take, from what I’ve read, $15-20bn from government revenue. If that amount is taken from redistribution policies it will attack confidence further and further reduce government revenue. Pretty sure tax changes are almost 100% about redistribution. Okay, maybe 99%. The growth arguments are mostly based on economics models that would be laughed at if they were explained to the average informed observer in plain english. Perhaps I’m biased toward it but I guess I trust Treasury when they tell me the difference in efficiency is large between these taxes. It makes sense to me that, for example, stamp duties are bad for the economy, while GST isn’t. Testing this argument emprically is going to be hard though isn’t it. Next Next post: Should we be more worried about the sharemarket, or housing?